About The Got to Be Competition Dining Series: This unique 15-dinner competition dining experience has traveled across the state of North Carolina to Asheville/Blowing Rock (Fire on the Rock), Wilmington (Fire on the Dock) and Greensboro (Fire in the Triad). Raleigh (Fire in the Triangle) and Charlotte (Fire in the City) are slated for later the summer and fall. 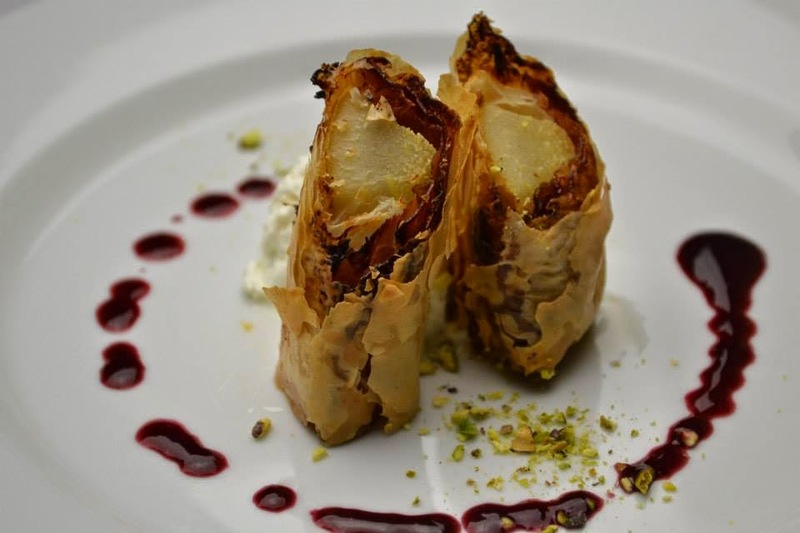 Chef Sherrill says, "My competitive advantage is my eclectic experience working in different restaurants gives me a wide range of styles which, in my opinion, work well in a competition of this caliber." This is Sherrill's and The District's 1st Fire in the Triad appearance. District (affectionately known as just "District") is known for its rooftop bar and amazing views of Downtown Winston-Salem, not its food. And trust me--it's not typical bar food. The night started off with a slow simmer, as many of the dining guests had never visited Graze OR District. 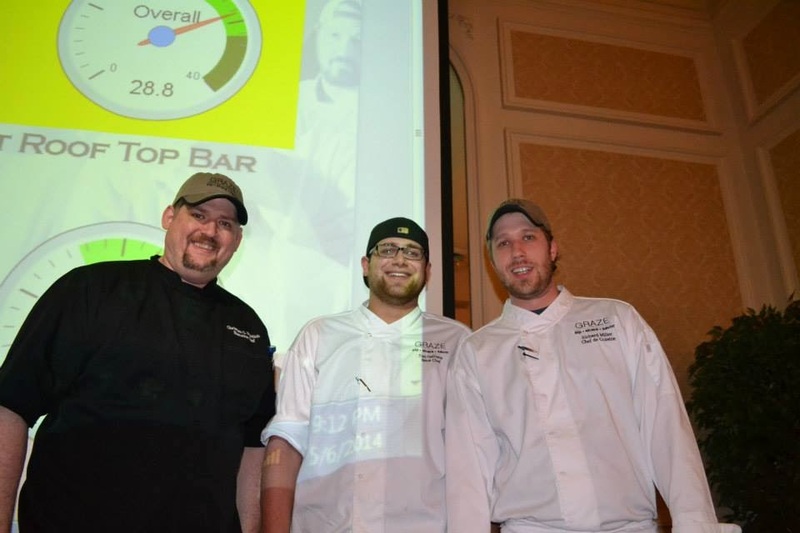 Most people try to guess which courses come from which chef (even though we're instructed not to and to vote with our palates by host and founder, Jimmy Crippen) and this time, people simply ate the food and really did judge on culinary merit alone. I've not been to Graze (yet). And I've only been to District a handful of times, so it was truly a blind tasting for me, personally. Guest judges for the evening: Chef Wes Patterson of Southern Roots in Jamestown and former Fire in the Triad competitor; Chef Jay Pierce of Lucky 32 Southern Kitchen in Greensboro and Cary AND former Fire in the Triad competitor; Chef Andy Hopper, former Fire on the Dock AND Fire in the Triad competitor; Isaiah Allen of Eddy Pub in Saxapahaw, NC and Rocky Run Farm in Mebane. Mangalitsa ham from Johnston County. Remember when I said the night started off slow? Well, it quickly sped up and Tuesday night was the quickest service in Fire in the Triad history, I think. I was home in Winston-Salem typing up this blog post at 10:00 PM. To keep up the fast pace of last night, I'm going to blow through each course the same way! This was more like a side dish than a first course, but the treatment of the ham was like none other: lacquered with the sweet, yet tart pomegranate molasses, it was like meat candy. 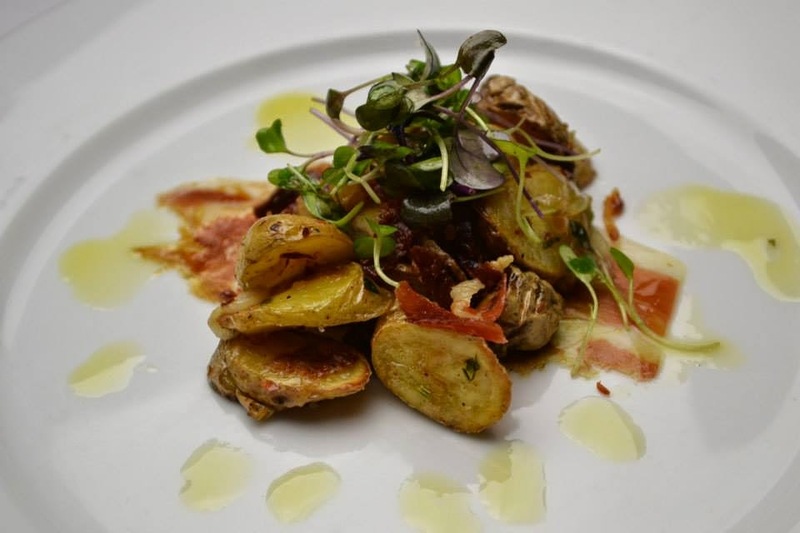 I had to dig through the crispy, yet soft duck fat glazed fingerlings to get to it. After chewing on my prize of delicious ham, I focused on the salad. The tuft of microgreens on the top added a little color and freshness to an otherwise heavy dish. Much respect and props to creativity and transforming the ham into something unexpected and delicious. I'm going to call this one "Fifty Shades of Quail". This course was the sexiest, most mouthwatering dish of the competition so far. The little Mangalitsa-wrapped quail leg's inviting arabesque from the grits was a total come-on. Cooked PERFECTLY, this quail was a perfect shade of pink inside, rendering it medium and the skin crispy. 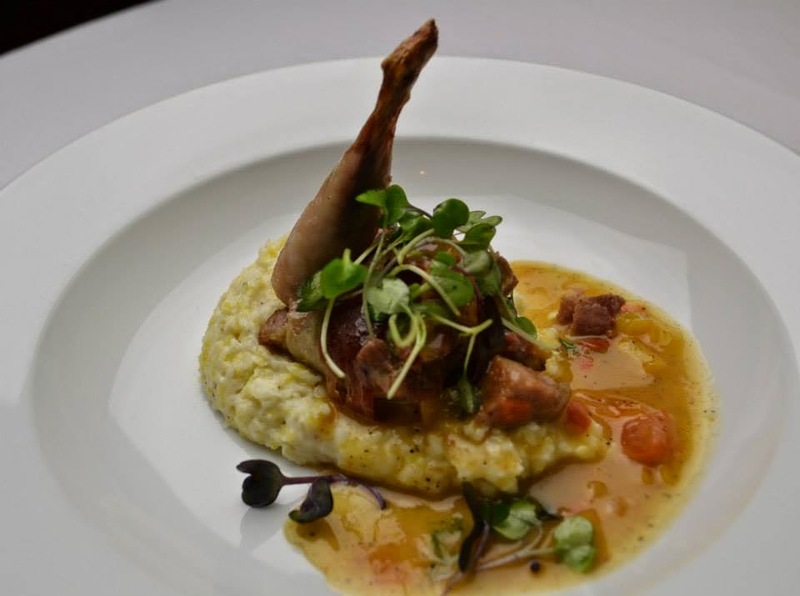 The pan gravy dotted with bit of tasso ham was a symphony of quail flavor and the cheesy grits were all buttery and sang slow jams to me even after the plate was long gone and taken away. Not the prettiest course, it reminded me of something my mom would make in an attempt to be fancy at dinner time. Some of the men at my table raved about this dish. Pork wrapped beef sitting on a bed of more pork? Yeah, they loved that part. Everything was too greasy. There weren't enough green beans on the plate. There were three. Just like what you see in the picture above. I think the Mangalitsa warm vinaigrette was code for "bacon grease". The droplets of cherry gastrique were well-executed, but there were so few, it was disappointing. 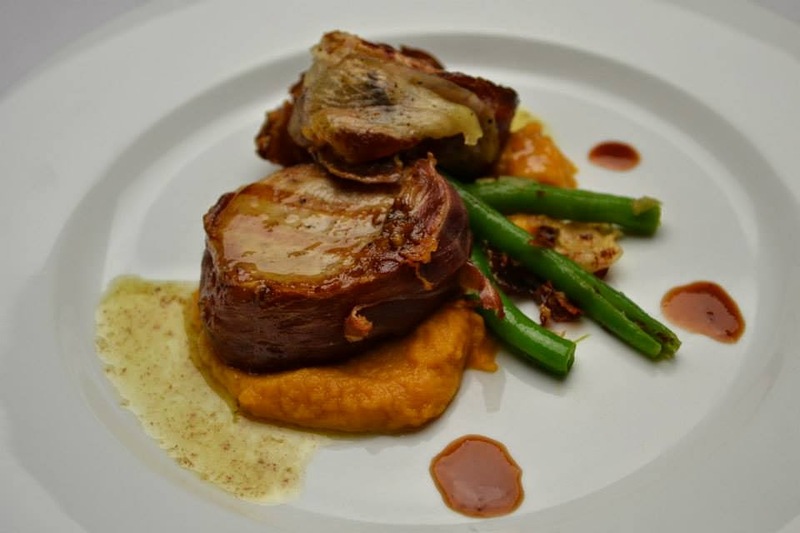 It would have been to have more to cut the fatty ham-wrapped veal (which was not uniformly cooked; some pieces were very rare, others overcooked) The sweet potatoes were the best part: very smooth, creamy and sweet. At first, I doubted that this was a dessert because I'd never had onions, chocolate, mustard and cornbread all together before last night. But it was a true chef's dessert: a cake with stuff on it. 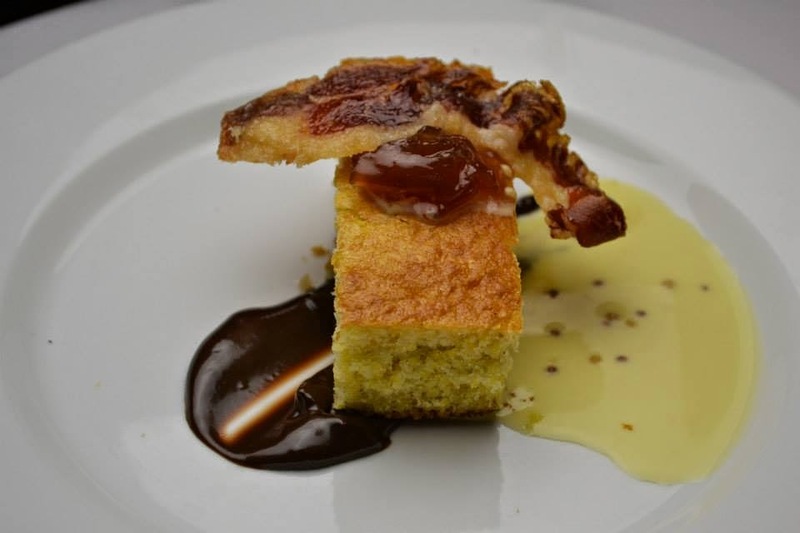 High marks from me on creativity, the cornbread sponge cake with topped with a sweet onion jam and didn't "jam" with the chocolate ganache, but it was great with the strip of ham known by its other name "tuille". To be honest, the whole dish seemed to be the awkward, yet really nice girl at the school dance that everyone ended up liking by the end of the school year because of her bold choice in confronting the school bully. I can't say I'd order this in a restaurant, but it was perfect for a night at the Fire. For score breakdowns and additional photos, please click here. 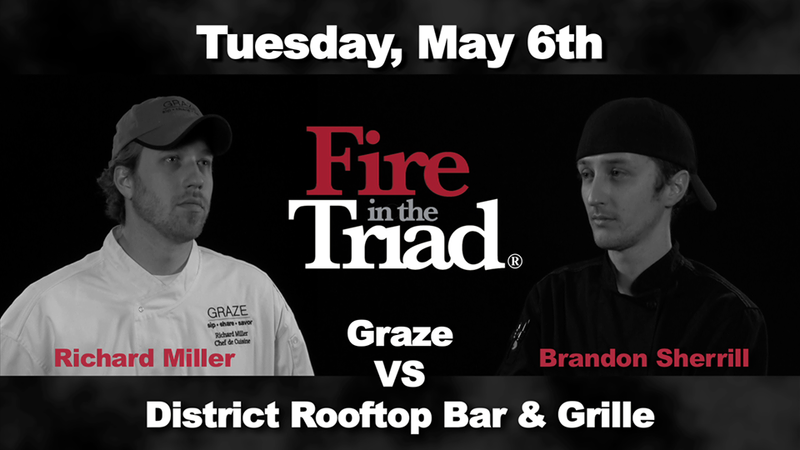 After it was all said and done, it was Team Graze that took the prize and another Winston-Salem chef goes on to victory. 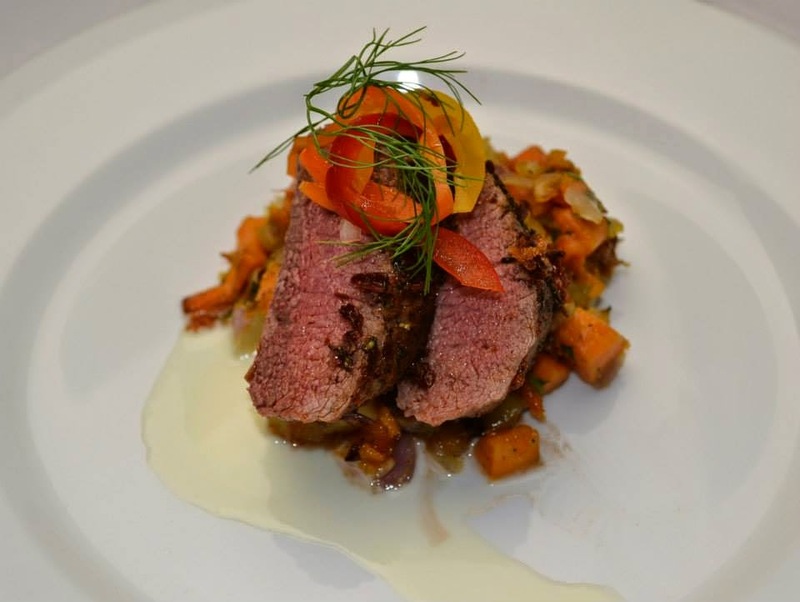 We will see Chef Richard Miller and his team again on May 20 against the winner of May 8's battle: River Birch Lodge Vs. Mad Hatter.